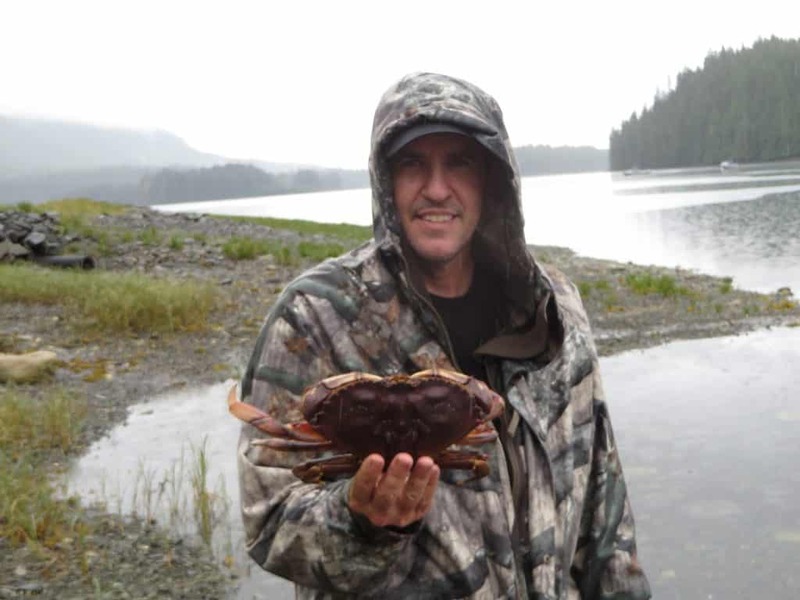 Crabs are always one of the highlights, fun to catch and eat. They will never be any fresher than they are here. You can see your pots from where you are cooking up your catch. There are crab pots here that you can borrow, tape to mark your buoys and a gauge for measuring. You can bait your pots with your fish carcasses, recycling at its finest. If you have never caught crabs before we will be glad to walk you through, its not rocket science and it brings out the kid in everyone. When you get back to shore you will clean your crabs down by the shore. We always clean our crabs before cooking, its easier, they cook better, they cool down faster stopping the cooking process, its a lot easier clean up, and if there is any algae bloom its removed when they are cleaned. The whole process is easy and we will walk you through it the first time. So come and try some fresh crab, the only downside is when you return home youll have a whole new take on the crabs youve been getting at the market. There is nothing better than a crab fresh out of the water. Spot shrimp are another local delicacy from the waters around here. Spot shrimp like the deep rocky bottoms. You will definitely earn your dinner pulling pots in the deep water. The spot shrimp around here are in 200 to 300 feet of water. Its pretty easy to locate the areas to fish as you will see other buoys. You will bait your pots with fish carcasses just like you did the crab pots. So if youre up for a work out you will be rewarded with an incredible dinner. One of our favorite ways to prepare them is to just throw them on the grill after a short marinade of oil and Lindas Hair of the Dawg spices. There just happens to be some in the cabin for your use. 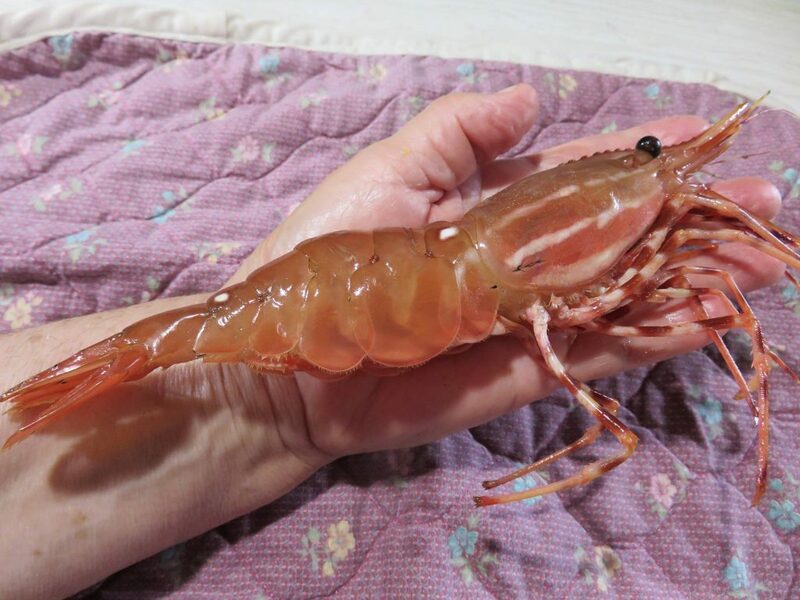 This was one of the larger shrimp we have caught. So thought it fitting post a picture in his memory, boy was he tasty. 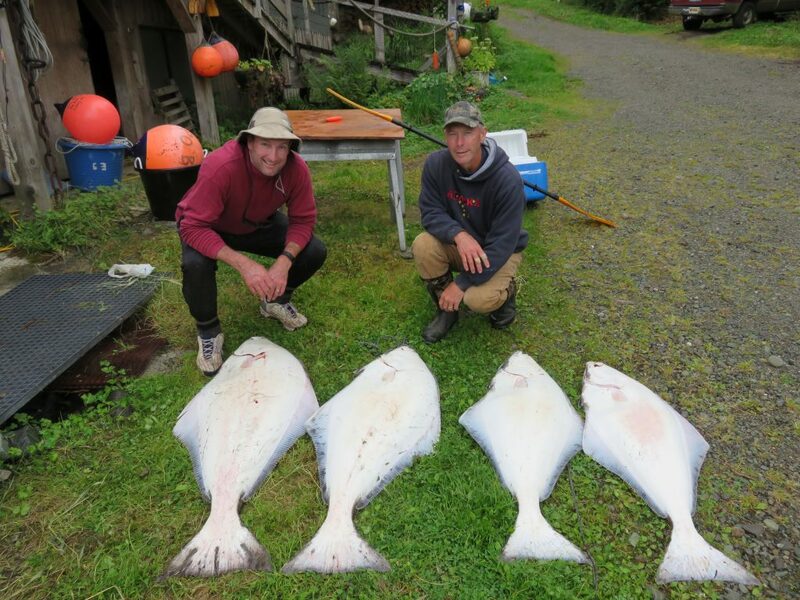 There are two different sets of rules for halibut fishing at this time. If youre on a charter there is a one fish limit with a reverse slot size limit. Dont worry your charter Captains have this program all dialed in for you. 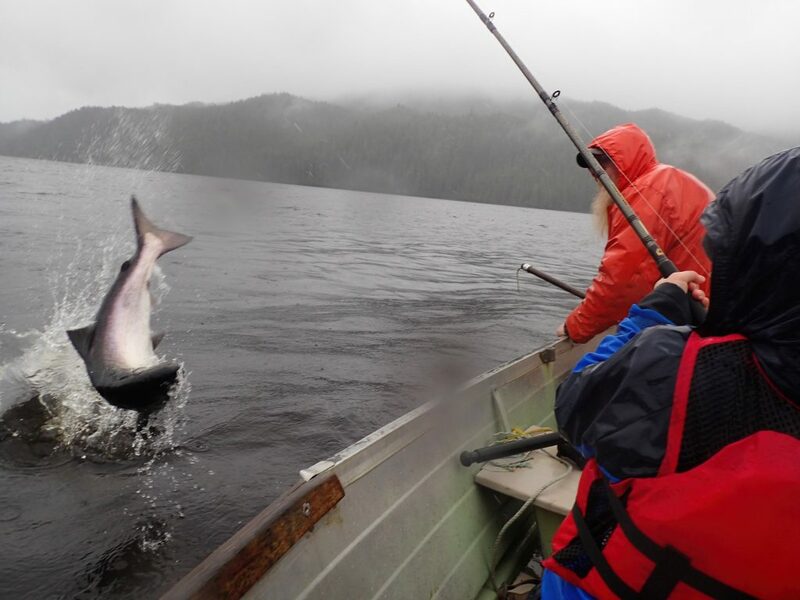 If youre doing an unguided trip, at this time you are allowed 2 fish of any size. Be sure and check the ADFG Saltwater Fishing regs and emergency orders just prior to your stay. They use the emergency orders to make changes to the regulations. One of the first things to take into account are the tides, youll want to utilize the best times around high tide and low tide. Our average tides on the east side of Prince of Wales are about 20 feet. That is a lot of water to move and in narrow spots the tide is cooking, so just plan on fishing the deeper water on slack tides. We fish anywhere from 100 to 300 feet of water usually where the sand bottoms are adjacent to some structure. There are several ways to rig up for halibut from using mooching gear, J hooks on a wire leader, jigs or circle hooks. Halibut like to follow scent trails so the slower you move usually the better your chances. Herring or chunks of pink salmon are both effective, we usually marinade ours or give the herring an injection with a scent. Pro cure makes several different scents that are awesome for laying down a scent trail. We have caught a lot of halibut using a mooching rig while fishing for kings but have lost a lot due to their teeth abrading the line. We use larger J hooks with wire, jigs tipped with herring or large circle hooks on a Gagnon. Landing large halibut takes a bit of patience to do it right. Whatever you do, dont be the TV moron shooting up your boat. When you bring a halibut up dont pull its head out of the water, it will just hang there just below the surface while you get ready for your next move. If you pull their head out of the water they are going to thrash around. After securing it we usually bleed the fish out overboard before bringing them into the boat. There is a halibut harpoon and a shark hook here, just ask and you can borrow whatever you are comfortable using. You can bring the smaller halibut right into the boat. Pull the fish in to the boat white side up and if they start to flop just rub their bellies and they will calm right down and you can take a spare Gagnon and bend them into a U to bleed them out. Smaller fish you can just bring them aboard with the pick and give them a whack. Yeah I know it sounds like BS but it does work and that is how we deal with them. Most halibut are lost at the boat when everybody gets excited. But if brining up a big halibut doesnt excite you what does? Saltwater fishing for Coho are just a kick when you zero in on them, the action can be fast and furious in a big school. Some days youll just peck around at the different areas trying to locate them picking up a few here and there, and then when a school comes through hang on. When that happens its not unusual for everybody to be hooked up and then who does what? A word of caution when they see the boat they can get plain goofy and acrobatic. So watch out for flying sinkers and hooks because its going to happen. So if this is your first trip here how are you going to find the fish? The fish come streaming into the Craig and Klawock area and run into San Juan Bautista the locals call it Saint Johns. The fish run into Diamond Point and then will go around either side. Its pretty easy to see the different areas to fish. Youll see pockets of boats hitting the local hot spots around the Island. Youll see boats running here and there looking for a school. There are 2 strategies to use, hang out and wait for the fish to come to you or run around looking for the hot spot. So just pick out a plan and go with it. Fish will also come down the outside edges of the bay. Fish will come into the Gulf of Esquibel along the North shore of Noyes past The Tree Hole Steam Boat and Pt Gertrudis on Lulu Is. Dont worry about the names they are more for dreaming about. There is no Tree at Tree hole, no steam boat, and Ive never seen Gertrudis. The majority of boats are going to be Charters so its easy to find the spots just by watching them. 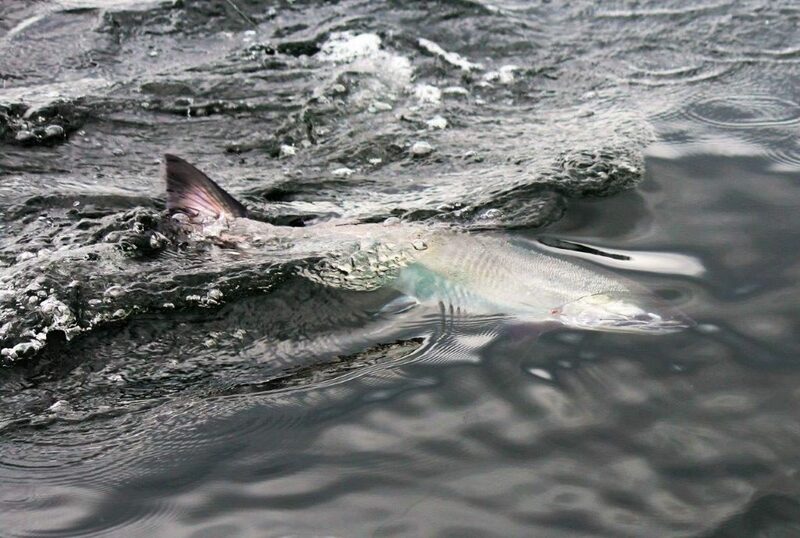 Charters do a lot of running so if it slows at all or they dont hit a fish in a couple minutes they run to the next spot. What do you do if youre in a good spot and it slows for a minute and the Charters run off? One thing we do is pour a cup of coffee and try to grab a sandwich. Weve ruined a lot of sandwiches using this strategy. Mooching is a great way to fish for silvers and extremely effective. 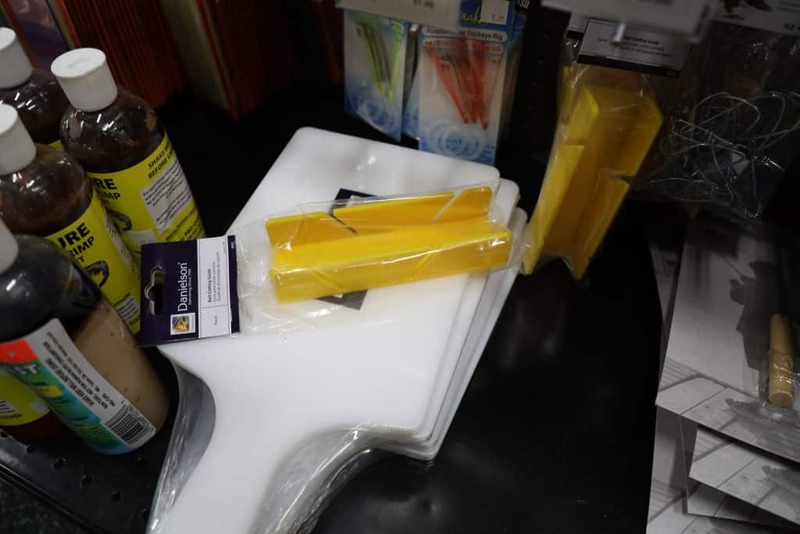 You can pick up a plastic miter gauge to cut your herring, they have 2 different sets of angles one for Coho and the other for Kings. Baits cut for Coho spin a little faster than those for Kings. Fish a 4 or 5 oz banana sinker with a mooching leader and use a controlled drop to the bottom and real it up. You want to go fast enough to get a spin on your herring. If the line goes slack on the drop (which is common) reel down into the fish until the rod is bent and then set the hook. The key is to reel into the fish and they will usually take care of the rest for you. When the silvers are coming up other fish tend to follow them so get your baits in the water and you can actually watch them take your bait. A word of caution when doing this, the fish are very aggressive and they will send hooks and sinkers flying. You can either net the fish or stun them with the gaff and then lift into the boat with the gaff and bleed them immediately. Kings are one of the most challenging and largest of the salmon to chase. The Saltwater fishing around Noyes and Baker Islands are World famous for the large Kings that feed here. 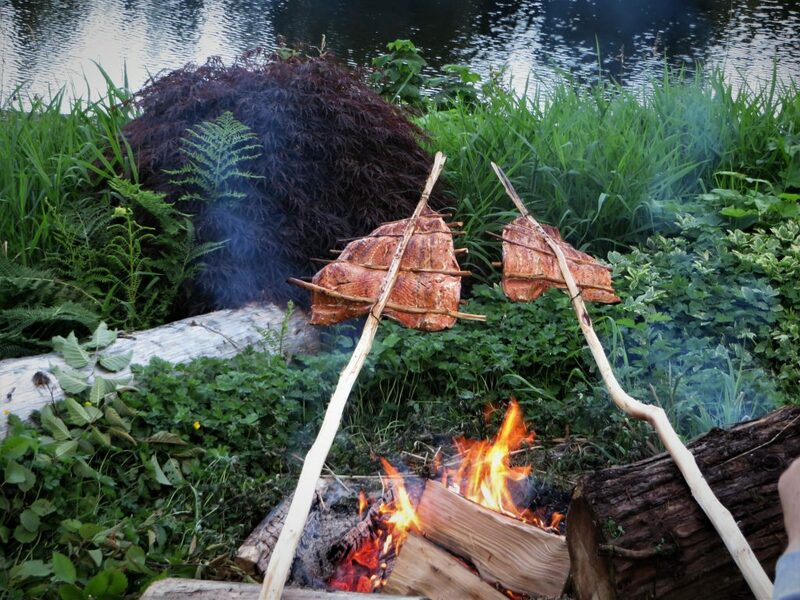 Fishing the Outside takes some experience and local knowledge. A great way to sample this fishery is with a Charter, there are some famous places out there youve probably heard of producing some impressive Kings, like Roller Bay, Pineapple Rock, Rock Pile, Addington and Veta Bay to name a few. So grab a charter and spend a day out there. If you do schedule a charter beware that current weather conditions will dictate where you will be able to fish. Earlier in the year the Kings are in the Islands to feed on the herring so you can do a self charter to chase them. They move all the way into Craig and the cliffs along the road. Then as summer starts to progress the Kings start moving away from town. One day while picking up freight in the spring, looked over and saw a large school of herring next to the rocks and a King came slicing right through them on the surface. The kings also move along the North shore of Noyes to Pt Gertrudis looking for feed where they are accessible. You will be able to access these fish if youre familiar enough with boats. Katie at Prince of Wales Excursions can help you evaluate your skill level and help find areas that are suited to you. The charters dont fish the outside every day because of weather and will move into the shelter of the Islands. Be sure and access NOAA weather to find the latest forecasts and plan your trip accordingly. Weather in SE Alaska is ever changing so just be aware. One good way to learn the area and get some fish is to hook up with Rocky over at Outer Otter Charters. So now that you have a spot one of the best ways to fish for Kings is mooching. Try not to get too excited when they first pick your bait and then reel down into them until the rods bent over. Never forget to reel, reel, reel when they turn around and run the other way. They can do this so fast you think you lost the fish. Its amazing the power they have when they take off on that first run. Check out some of the videos UTube has on mooching. First thing to do to your catch is to bleed them immediately, just cut their gills. The better you take care of your fish the better they will be at the table. Saltwater slush ice is the best way to cool down your catch and keep it fresh. Crushed saltwater ice is available in Craig down by the fuel dock. The City of Craig sells the ice on the honor system for a $1 for a 5 gal bucket. The fuel dock is on JT Brown St just before you get to the High School, there are a bunch of business signs by the road. Take the road all the way to the end out onto the pier. On the left side are some large square plastic totes that have ice. Lift the lid and fill your bucket and then you can pay for it at the building in front of you on the left side. There is a slot in the door to put your dollar in. If youre fishing on this side of the island you can fit a couple buckets of ice in the freezer up at the cabin. 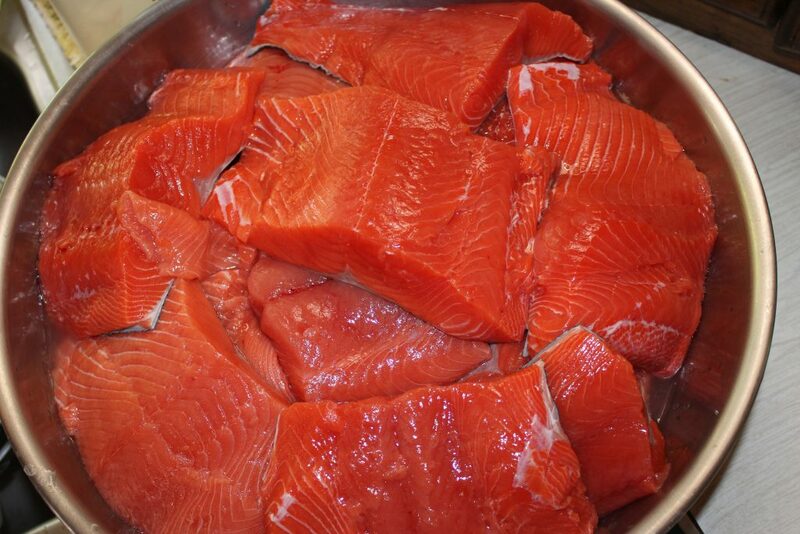 Salt water ice is much better for taking care of your catch, but regular ice is much better than no ice. If we are fishing on the other side we clean our fish at the dock and lay out the fillets on top of some fresh saltwater ice and process them the next day. So there are a couple of ways you can take care of your catch. There are some charters that will do it all for you. You can fillet your fish or take the whole fish over to Island Processing where they take care of it for you and flash freeze it. You can then bring it back over here and put it in the freezer on the deck. We also have a place for you to filet your catch here when you are fishing on this side.